When would you create a new theme? How do you define the theme hierarchy for your project? Demonstrate the ability to customize/debug templates using the template fallback process. How do you identify which exact file is used in different situations? How can you override native files? When we want to change the appearance of our site or its functionality, the first thing we should do is to create a new theme. Check out our Magento 2: Creating a New Theme article to see how it’s done. In other words, if the system does not find the required file in the current theme, it looks for it in the parent theme (the parent theme is specified in the theme.xml file in the root of the theme), and if it does not find it there, it looks for it in the basic theme. In order to customize a specific template file for a parent or base theme, we need to copy it to our theme at the same path as it was in a parent or base theme. Remember never to delete this file from a parent or basic theme, since this will make it difficult to debug this file if it is lost or damaged. In other words, if we want to debug a template file from the current theme (for example, we may have accidentally deleted it or edited it and there was no backup version left), you can always find this file in the parent or basic theme. ⦁ Template path hints (displays templates’ names and paths). More information on debugging methods: Developer Mode and Debugging in Magento 2. In order to determine which template file is used in a certain place on the site, it is convenient to turn on the path hints for this file. Next, go to the “Advanced ➜ Developer” section. Here, on the “Debug” tab select “Yes” for the “Enabled Template Path Hints for Storefront” attribute. If you have multiple stores, then choose the one for which you want to turn on the path hints. Please notice that if we turn on the path hints, it will be enabled for all site users and if the site is in production, then this is unacceptable. To enable path hints only for a particular IP-address, on the “Developer Client Restrictions” tab in the “Allowed IPs (comma separated)” field, write a specific IP-address (if it is necessary to write multiple IP-addresses, they should be separated by a comma). Following the specified path, we can easily find the required template files. Overriding native files in Magento is quite easy. To do this, you need to copy these files to your theme at the same path as they were in the parent or basic theme. To do this, we need to copy the file, located at: “app/design/frontend/our_package/our_theme/Magento_Catalog/templates/product/view/gallery.phtml”. As a result, the system will use the gallery.phtml file from our theme, instead of the file from the parent or basic theme. Please note that this method overwrites the template files. However, if you copy the layout file in a similar way, it will not overwrite but will complement the file of the parent theme. 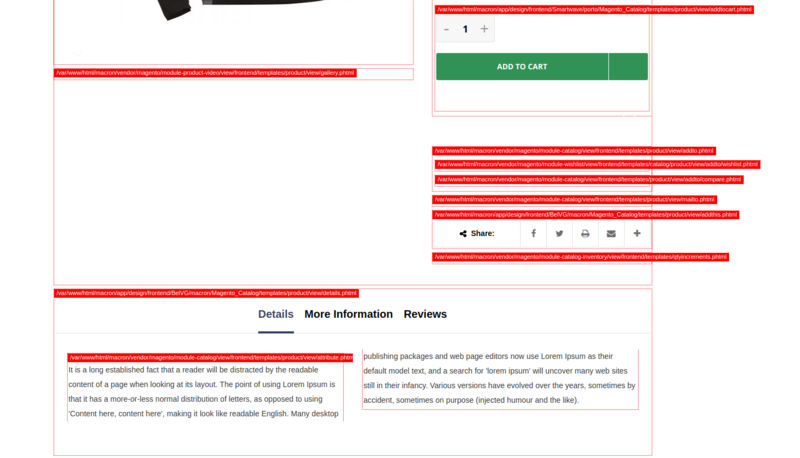 More information on re-writing layout files in Magento 2: Override a Layout in Magento 2.